If like me you have cables all over your desk, that cause birds nests whenever you throw them in your bag. A new product called Recoil Winder has been created which could help your keep your cables in order and prevent them tangling together. The Recoil Winder has been developed by David Alden, and have just started their journey on the Kickstarter website looking to make the jump from concept to production. The project up until now has been self-funded by Alden, but now the designer needs a little help to create the final production products. Watch a video after the jump to see how they work and help keep your cables tidy. To use the Recoil Winders to tidy your cables, simply make a loop and place it over the hook within the Recoil. 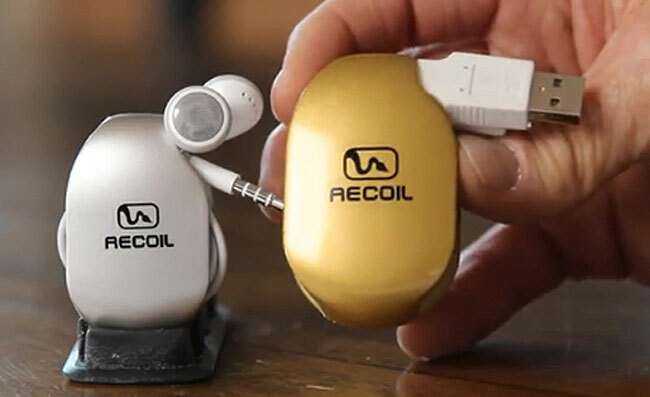 The Recoli will then automatically coil up your cable, and has even been designed to accommodate the mics that are included on headphones for smartphones. As easily as they were added the cables can then be removed from the Recoil Winder when needed. But if you prefer you can also leave the Recoil Winder permanently attached to your cords. which Alden says is best for charges, since you only need to use the full length of cable very rarely. For more information about the new Recoil Winder, jump over to the Kickstarter website where its designer explains his inspiration and what you will receive for each pledge you make.